It’s nearly February and time for the valentine parade to begin. Greece’s Anarina Anar leads us off with a new necklace. 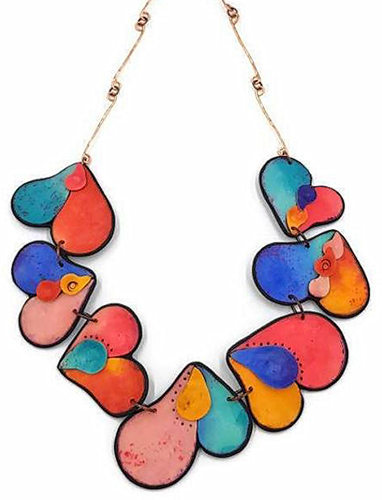 Her hearts are assembled from several shapes, made of light clay shaded with pencils or inks. A black backing also serves to outline her bright colors. A bit of texture and some teardrop elements make hers an unusual treatment. The hand-drawn colors and changing shapes keep your eye skittering around this gathering of hearts. You’ll find them on Etsy and Instagram. Need a little more polymer love? Head over to StudioMojo for a taste of the wider world – lots of tidbits that we couldn’t cram into PCD. This week we hunt down the experimenters, track the exhibitionists and find new ways to keep your muse happy and your mojo working. Have you ever featured Tishaia? I couldn’t find her in a search of your site. Perhaps also goes by another name?